A Must-Have For Any Fiddle Player! Aarun was asked to contribute 59 fiddle tunes on CD for Mel Bay's "Anthology of Contest Fiddle Tunes" by Joe Carr. Carr has collected unique variations of breakdowns, tunes-of-choice and waltzes from a who’s-who of great first generation fiddlers including Benny Thommason, Major Franklin, Norman Soloman, Terry Morris, James "Texas Shorty" Chancellor and others. Many tunes appear here for the first time. Included is a special discussion of authentic bowing. Click photo to purchase from Mel Bay. 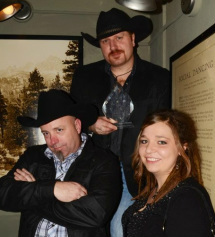 On January 22nd 2012, The Concrete Cowboys were recognized as the best country band in the state! Visit the "listen" page to hear the singles that were featured on 98.7 KUPL!